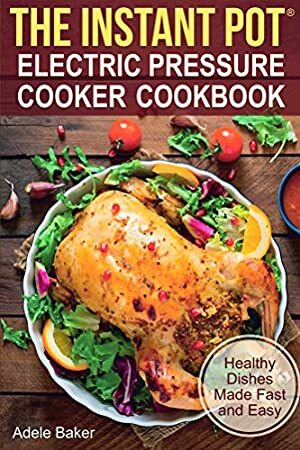 With The Instant Pot Electric Pressure Cooker Cookbook you'll create an amazing variety of healthy, fast-to-make pressure cooker recipes. Who knew you could make cheesecake in a pressure cooker? Learn how to prepare favorite dishes quickly and safely in your beloved Instant Pot®. With the capabilities of today's electric pressure cookers, the possibilities are endless. Use these "made-easy" recipes, and start cooking today! Log In to track Adele Baker on eReaderIQ. to be notified each time the price drops on any book by Adele Baker. to stop tracking Adele Baker. We started tracking this book on December 15, 2017. The price of this book has changed 35 times in the past 490 days. The current price of this book is $0.99 last checked 15 hours ago. The highest price to date was $4.99 last reached on May 31, 2018. This book has been $4.99 2 times since we started tracking it. We last verified the price of this book about 15 hours ago. At that time, the price was $0.99. This price is subject to change. The price displayed on the Amazon.com website at the time of purchase is the price you will pay for this book. Please confirm the price before making any purchases.